At Williamsburg Garment Company, we are known for producing high quality raw denim jeans as well as clean authentic look premium denim washes in four great looking fits. WGC men’s jeans have timeless style, void of outer labels, stitch decorations and branding. Based in Williamsburg, Brooklyn, New York, we have been producing only American made jeans since late 2013. With extreme pride in our products, we are believers that our denim can go head-to-head with any jeans, at any price. Why raw denim? Because denim enthusiast know, raw jeans allow you the enjoyment of breaking in a pair that will conform and age to your unique body shape and stress areas. There’s no artificial wash that can compare to the beauty of a naturally aged pair of jeans which started out raw. Look inside a pair of Williamsburg jeans and then look inside other higher priced jeans. 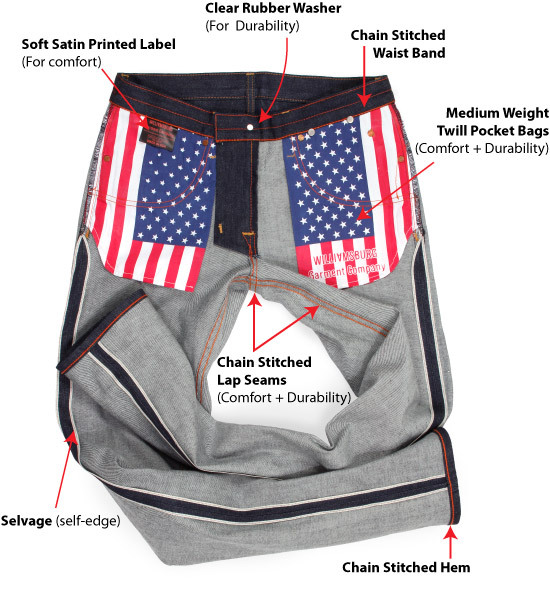 What you’ll find is we use the best possible sewing techniques in the construction of our jeans: Lap seams at the seat and inseams; chain stitching at waistband, hem, out-seams and lap seams, sewn using high quality American made or Japanese denim. About 90% of the denim we use is from Cone Denim Mills, America’s oldest and most recognized producer of denim and to remainder from top Japanese denim mills. Shop Williamsburg jeans today! High quality American made jeans featuring selvedge denim and premium denim washes, from skinny, slim or relaxed fits for men.